As we kick off the new year, a fitness tracker showdown felt especially appropriate – after all, have you seen all the new faces at the gym these past couple weeks? Fitness trackers have blown up in a big way, and though the wearables space has gotten pretty crowded, there are a few clear standouts. Among them? Fitbit and Misfit. Fitbit is the better known of the two brands, but Misfit has carved out a substantial niche for itself in the “I want to be healthy, but I also want to wear something that goes with my outfit” market. And for my purposes, they're a great matchup: Both brands do absolutely killer marketing. Let’s see who truly steps it up in the inbox. As someone who owns a Fitbit, I can safely say that these guys absolutely nail the customer onboarding experience. Immediately after I got my Fitbit, I downloaded the app that goes with it, and they asked for my email address as part of the registration process. Soon after, I received this welcome note. Not only does this email do a fantastic job walking me through all the cool features my Fitbit has to offer, but that’s my EXACT PURPLE FITBIT in the header! It's a great example of personalization (in the subject line and the email content), and it shows they're paying attention to my individual experience with their brand. Subject line: Thanks for using the new Fitbit app! I’m always in favor of a good thank you email, and this plain text send feels extra personal. It’s simple, for sure, but that also helps it stand out from their regular mailings. I’d venture to say that this email (which is most likely automated) does a ton of heavy-lifting when it comes to generating positive reviews for their app. The next email in their welcome series continues the precedent set in the first one: This brand provides value to their subscribers above all else. Rather than trying to sell me something new, they want me to get the most of the thing I already bought – and if they build customer loyalty (and encourage repeat purchases) in the process, all the better! One of the biggest appeals of a Fitbit is that it allows you to be social and compete with your friends via fitness challenges. This next email in the welcome series brings attention to that capability with clever copy, attractive product images, and a singular, focused CTA. Fitbit waits until the fifth email in the series to ask me to buy something, which I appreciate. At this point, they’ve earned that right – plus, they do a great job of demonstrating the value this purchase would add to my product experience rather than just touting discounts. Seasonality + clever copy makes for a cute, effective Valentine’s Day send. I love the imagery up top, and the clean layout of this email helps keep things scannable. I’ve seen more and more emails like this from brands that produce tech products, and they stun me every single time. This is the definition of “right person, right message, right time," and you can’t get much more effective than that. • They don’t take advantage of preheader text. 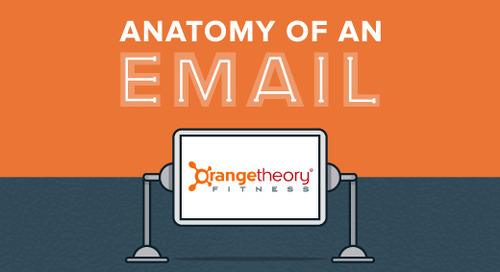 • Though their emails are technically mobile-optimized, text can be difficult to read on a small screen. • Some of the emails I received (though not all of them) are comprised of one large image. Depending on their primary goal with email marketing, people will have different feelings about the double opt-in. In my opinion, it's a good thing to include in your strategy. Having new subscribers confirm that they actually want to hear from you ensures you're communicating with the right people (not fake or incorrect email addresses), helps boost your delivery rates, and keeps your messages out of the spam folder – all huge positives. And if someone doesn't click through that initial message, chances are good that they wouldn't have paid attention to the rest of them, anyway. After confirming my subscription, I received this welcome email. The sentiment is nice, and it looks good... but I was immediately struck by the fact that Misfit doesn’t ask me to DO anything. Since your welcome email is one of the most-opened messages you'll ever send (open rates for welcome messages hover around 50%), you should capitalize on that powerful first touch to encourage action from new subscribers. The header doesn’t link to their website, nor does the logo; in fact, other than the social follow buttons at the bottom, the only clear path I can follow in this email is to unsubscribe. This welcome note could definitely see some improvement. Misfit doesn’t send new subscribers any sort of welcome series (I double-checked with another Emma staffer who owns one). Instead, they just throw them into their regular send cadence. Since I signed up in December, the second email I got was this festive holiday promotion. I love the simplicity and clean design of the campaign, and the encouraging CTA – “You got this" – is a nice touch. Guys, I can’t help it: There may not be anything that strategically interesting about this email, but I was so taken by the design of this campaign. It's scannable, it looks incredible on mobile, and they let each product shine without the mailing ever feeling too jumbled or crowded. Misfit’s email designer deserves a high five. Subject line: Final Hours – Free 2-Day Priority Shipping Ends Soon! By the time I got this email, I was a little over their lackluster subject lines. That GIF, however, is next-level stuff. It immediately caught my attention and created a sense of urgency around their promotion. And as a plus, it utilized gorgeous, engaging product imagery to do it. After primarily receiving promotional mailings, this “Happy Holidays” message was a nice change of pace from their regular send cadence. In this case, I appreciated the fact that they didn’t include a CTA, and the warm-and-fuzzy messaging was on-point for the holidays. Misfit continued to capitalize on seasonality with this "New Year, New You" send. As always, it looked great – and they did a great job tying specific resolutions to specific products for a campaign that felt a little heftier than a generic "Buy now!" message. • They don’t send a welcome series. • Their subject lines could use some work. I appreciate being straightforward about what your email contains, but a little more personality would most likely improve their open rates. • They could stand to do a little more segmentation and personalization. If I had to guess, the majority (if not all) of these emails were sent to their entire list. If this was purely an email design battle, I might give this one to Misfit (seriously – just look at one of their sends on mobile). But as far as overall strategy goes, Fitbit blows them out of the water. To be fair, they're a much larger company that probably has more experience and access to more complex email marketing tools. We’ll see if the tide turns as Misfit continues to grow, but for now, Fitbit takes this showdown.